SALT LAKE CITY, UT - FEBRUARY 9: The Utah Jazz huddle up against the San Antonio Spurs on February 9, 2019 at Vivint Smart Home Arena in Salt Lake City, Utah. A quiet trade deadline passed on Thursday afternoon, and the Jazz—with the exact same group they've had all season—proceeded to take the floor for a rare Saturday matinée against the San Antonio Spurs. The results were certainly encouraging: a 125-105 victory to put Utah (32-24) alone in sixth place in the Western Conference standings—one game ahead of San Antonio (32-26) with one game left before the All-Star break. While the Spurs are right in the middle of an eight-game road trip, the Jazz have spent the entire week at home—and hadn't played since a 28-point win over the Suns on Wednesday. "The rest helps a lot," Utah's Derrick Favors said after the game. "Every team's going through it right now, so we've just got to find a way to continue to fight and get better and win games before the break." Six Jazz players scored in double figures, with Donovan Mitchell (23 points, five rebounds, five assists, three steals) and Rudy Gobert (21 points, 13 rebounds) leading the way. Royce O'Neale (17 points), Ricky Rubio (16 points), Favors (11 points, 10 rebounds) and Joe Ingles (11 points) also scored in double figures for the Jazz, who have now won 14 of their past 17 games. DeMar DeRozan scored a team-high 23 points for the Spurs, while LaMarcus Aldridge added 15 points in the loss. San Antonio has now lost four straight games. Early in the game, Rubio passed up a wide-open three, instead swinging the ball to Kyle Korver—normally a great idea, only this time Utah's sharpshooter was blanketed by two defenders. Utah's possession was wrecked. From that point on, though, Rubio was excellent. He attacked the rim, found open teammates, took open shots. He scored 16 points on 7-for-13 shooting, and added six rebounds and six assists—without a turnover—in 27 minutes. Gobert went head to head with Aldridge—and only one of them played like an All-Star. (Hint: it wasn't the one who's actually going to next week's All-Star Game.) Gobert finished 21 points (on 8-for-10 shooting), 13 rebounds, four assists and two blocks, while Aldridge—who will be making his seventh All-Star appearance—struggled mightily against The Stifle Tower, shooting only 5-for-16 from the field and finishing with a net rating of -11. Gobert has now blocked at least two shots in 14 straight games, and he's tied (with Philadelphia's Joel Embiid) for the league lead with 45 double-doubles. The Jazz trailed by as many as seven in the first quarter before finishing the period on a 11-5 run to pull within one. 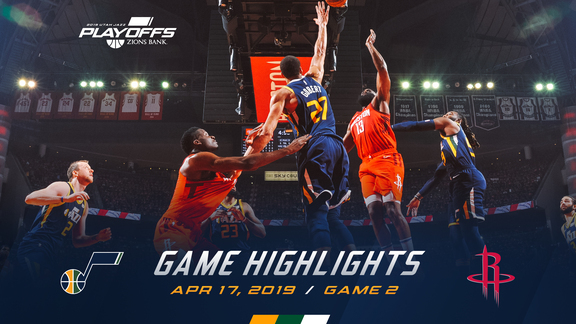 A reverse layup by Rubio and five points by Favors—including a three-point play—gave Utah a four-point lead early in the second period. A 3-pointer by O'Neale, a putback dunk by Gobert, and a midrange jumper by Mitchell pushed Utah's lead to nine midway through the second quarter. The Jazz would lead by 14 at halftime, thanks in large part to another two threes by O'Neale, who finished the first half with nine points, and one triple from Rubio just before the half. The Jazz would maintain a double-digit lead throughout the second half en route to the 20-point victory. The Jazz owned the low post, outrebounding the Spurs 52-36 and outscoring them 50-38 in the paint and 9-4 on second-chance points. Favors logged his eighth double-double of the season, and the Jazz are 7-1 in those games. Utah knocked down 16 3-pointers in 41 attempts (39.0 percent), with O'Neale (4-for-4), Ingles (3-for-5), Crowder (3-for-9) and Mitchell (2-for-9) each making multiple threes. San Antonio made six threes in the first half but only one in the final two quarters. 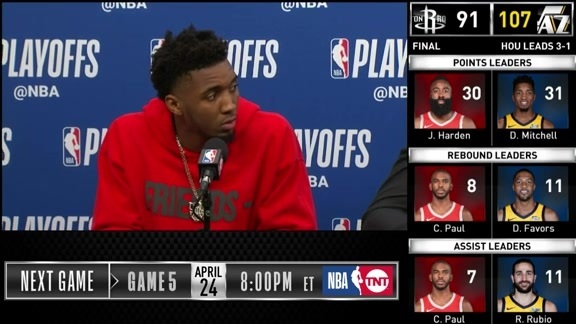 "[Ricky] passed the shot up early in the high quadrant, and I got on him and told him to shoot it. It doesn’t mean he needs to shoot it every time—it means he needs to attack. When he attacks, good things happen." The game started at 3pm. ... Gobert picked up a technical foul in the first quarter. ... Danté Exum (ankle) missed his 16th straight game for the Jazz, while Thabo Sefolosha (hamstring) played (three minutes) for the first time since January 5. ... Rudy Gay (ankle) sat out for the Spurs. ... 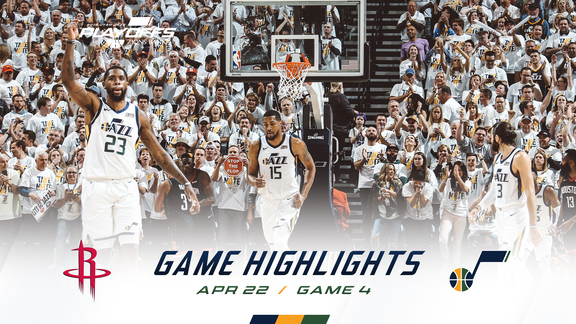 The Jazz scored 39 points in both the second and fourth quarters, and they outscored the Spurs 78 to 54 in those periods. ... Utah shot 52.2 percent from the field and dished out 29 assists. ... The teams combined for only 20 turnovers (11 by the Jazz, nine by the Spurs). ... Utah is now 18-10 at home. The Jazz will hit the road to face the Golden State Warriors on Tuesday in their final game before the All-Star break. Tipoff is set for 8:30pm MT.